Finding the space in your home to dedicate to a home office is not always easy. As we tend to prioritize the other parts of our home such as the living room, bedrooms and kitchen, we tend to skimp when it comes to assigning space for an office. As a result, many of us have tiny home offices that feel cramped which as a result can hinder productivity. But if you think that your office doesn’t have enough space to allow you to efficiently function, think twice! With the following tricks, you can squeeze everything you need for a fully loaded workspace and still having enough room to breathe. When it comes to maximising office space, corner desks are often the ideal solution. 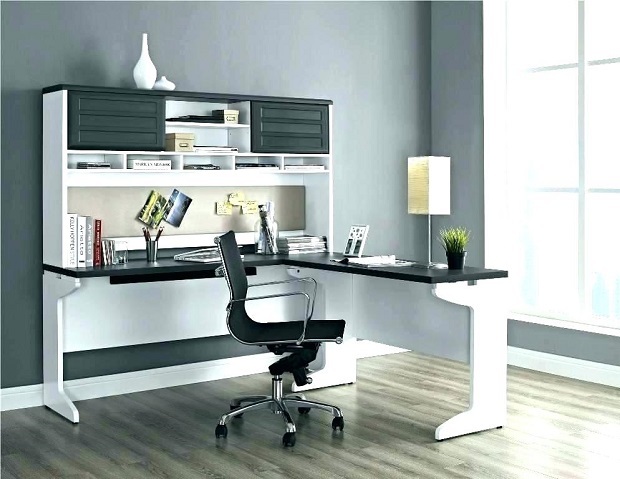 Also known as L-shaped desks, corner desks are often larger than regular desks and offer enough work surface to fit a computer, documents and all the items you need to complete daily tasks. However, as opposed to standard desks, they actually free up valuable space as they can perfectly fit in the corner of the room. So, by using a corner desk, you can concentrate everything you need to work in one corner. By doing so, you can use the remaining space for a cabinet, some decorative plants, a comfy armchair when you want to take a break, or just leave it empty to make the room seem larger and airier. Hey, if you can’t spare a separate room for a home office, just by adding a corner desk to your living room or a bedroom you can instantly create a work spot. Whatever your situation is, a corner desk is definitely a great option to consider. Just think about it, what are the bulkiest elements in your home office that will take up the most space? Furniture, of course. Too much furniture can make any room feel cramped and smaller than it actually is. So, make sure to only use a minimum amount of furniture. However, that doesn’t mean that you only need to stick to a desk and a chair. After all, that would be rather depressing, right? So, try to add some additional furniture such as a tiny coffee table or an occasional chair. Just make sure that all your furniture is leggy and slim in order to prevent a claustrophobic feeling. With that being said, ghost chairs are perhaps one of the best pieces that you can include in a small office space. The fact that these chairs are nearly invisible means that they do not take up much space visually. Many of us prefer working on a desktop computer with a large monitor that isn’t in your face like a laptop is. So, if you’re going to use a desktop computer, you may want to consider mounting the monitor on the wall. Because you have to admit, despite how much you love your computer, the darn thing takes up a lot of space on the desk, leaving little room for anything else. So, by getting the monitor out of the way, you can be free to purchase a narrower desk and free up some more space in the room.